The High Carbon Stock Approach (HCSA) wishes to advise stakeholders that Golden Veroleum Liberia (GVL) is not a member of the High Carbon Stock Steering Group. This clarification was confirmed by the HCSA Executive Committee during its meeting on Thursday the 4th of October 2018. Golden Veroleum Liberia was previously incorrectly listed as a member due to its involvement in working groups as an alternate for an existing plantation company member. The High Carbon Stock Approach has received information on allegations of breaches of the High Carbon Stock Approach by Golden Veroleum Liberia in its operations in Sinoe County, Liberia. As GVL is not an HCSA member, an investigation is underway to assess if there has been a breach of the requirements outlined in the High Carbon Stock Approach Toolkit in regards to the application of the HCSA methodology. The outcome of this investigation will be reported publicly and directly to stakeholders that have raised concerns on this case. The High Carbon Stock Approach Toolkit and Decision Tree will not be altered for application in High Forest Cover Landscapes (HFCLs). However, the HCSA Steering Group will work with stakeholders to identify alternatives to the industrial plantations model in HFCLs, meeting community aspirations and allowing development as well as conserving HCS forests in the long-term. For a strictly limited number of existing “legacy cases” of concessions in HFCLs that meet eligibility criteria and agree to enter into a due diligence process, this may include limited conversion subject to specific thresholds and procedures, via an agreed legacy case review process. Additional information on the Legacy Case review process will be available in the next 30 days on the HCSA website. Members of the High Carbon Stock Approach (HCSA) Steering Group have long recognised that many agricultural development projects are slated for development in High Forest Cover Landscapes (HFCLs), defined as landscapes with over eighty percent forest cover. In these landscapes there may be insufficient area or optimal arrangement of degraded land to support development of large-scale plantations, while governments and local communities are anticipating the implementation of projects, including those where the Free, Prior and Informed Consent has been obtained from rights holders. Following deliberation by the HFCL Working Group in 2017, it has been decided that the HCSA methodology and Decision Tree will not be altered for application in HFCLs. Sanctioned deforestation in these landscapes is not compatible with a No Deforestation commitment, and this decision will maintain the credibility and rigour of the HCSA as a tool for putting No Deforestation into practice. This decision provides needed clarity over the scope of the HCSA for its stakeholders, further strengthening ongoing efforts to incorporate HCSA into certification schemes and improve support and adoption by governments. 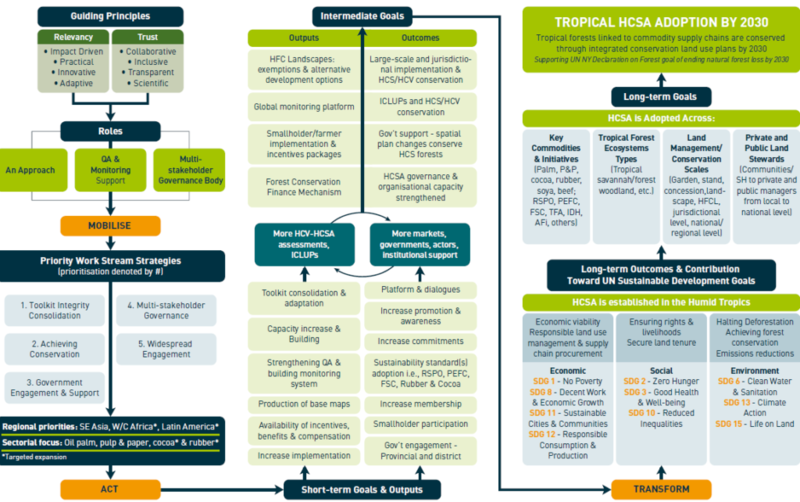 In recognition of the development aspirations of communities and governments in HFCLs, as well as the importance of these forests for keeping climate change below 1.5 degrees and biodiversity, the HCSA Steering Group will instead shift its focus to researching, identifying, and developing new strategies, financing, and stakeholder engagement tools for these contexts. These will assist actors in HFCL areas to identify alternatives to the industrial plantations model that will allow development as well as the conservation of HCS forests. Such assistance will be based on cooperation with local communities as primary rights holders, as well as NGOs, governments, and the private sector. It is anticipated that this will include pilot projects and demonstration case studies to test different models and generate replicable and scalable proofs of concept. In parallel, for a strictly limited number of “Legacy Cases” that meet specific eligibility criteria and agree to undergo a due diligence process, the HFCL Working Group will focus on assisting communities, companies, and their partners working in these existing concessions within HFCLs to prioritise conservation outcomes. In certain instances, following application of the Toolkit and Decision Tree, the Integrated Conservation and Land Use Plan (ICLUP) process may include limited conversion of identified HCS forest that does not exceed the Young Regenerating Forest (YRF) vegetation class and maximum area thresholds defined by the HCSA Steering Group. A key focus will remain on building alternative livelihood and development options to the large-scale plantation model, and decisions on limited conversion exceptions for YRF areas will be determined via a mutually agreed decision-making process with affected communities. These options will include assurances for long-term protection of High Conservation Value (HCV) areas and HCS forest. Shortly, the HCSA Steering Group will disseminate additional information about eligibility criteria and the due diligence process for those existing projects in HFCLs that wish to apply for consideration as valid Legacy Cases. Interested parties should note that in order to be considered a valid Legacy Case, a moratorium on forest clearance must have been enacted and any active clearance during the application process will serve as a disqualification from further consideration. The HCSA Steering Group recognises that this strategy restricts options for concession-holders in High Forest Cover Landscapes, and that some direct or indirect future development may occur. The Steering Group will monitor potential ‘leakage’ and may at a future date decide to re-evaluate the approach to ensure that our strategy continues to address our goal of stopping broader deforestation associated with commodity production.